The Ottoman Empire ruled a large portion of the Middle East and Eastern Europe for over 600 years. It first formed in 1299 and finally dissolved in 1923, becoming the country of Turkey. The Ottoman Empire was founded by Osman I, a leader of the Turkish tribes in Anatolia in 1299. Osman I expanded his kingdom, uniting many of the independent states of Anatolia under one rule. Osman established a formal government and allowed for religious tolerance over the people he conquered. 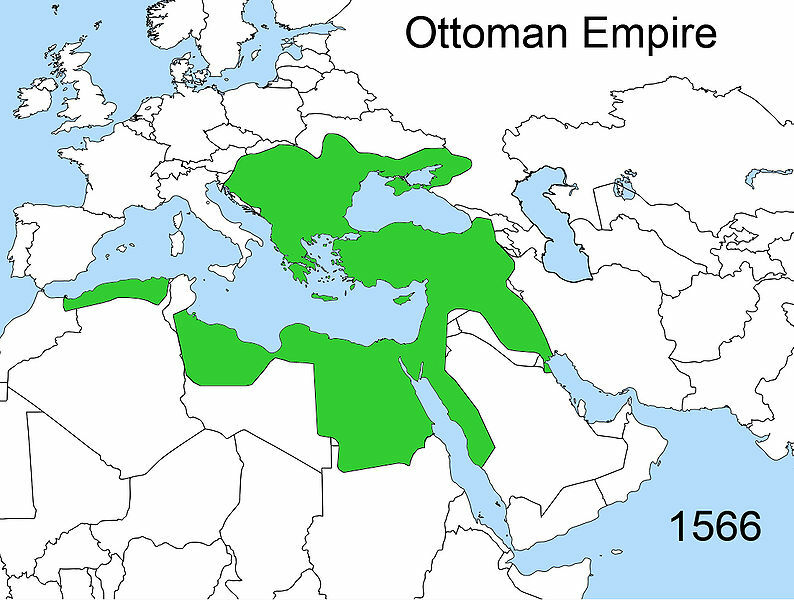 Over the next 150 years the Ottoman Empire continued to expand. The most powerful empire in the land at the time was the Byzantine Empire (Eastern Roman Empire). In 1453, Mehmet II the Conqueror led the Ottoman Empire in capturing Constantinople, the capital of the Byzantium Empire. He turned Constantinople into the capital of the Ottoman Empire and renamed it Istanbul. For the next several hundred years the Ottoman Empire would be one of the largest and most powerful empires in the world. When Constantinople fell to the Ottoman Empire, a large number of scholars and artists fled to Italy. This helped to spark the European Renaissance. It also caused the European nations to begin to search for new trade routes to the Far East, beginning the Age of Exploration. The Ottoman Empire reached its peak during the reign of Suleiman the Magnificent. He ruled from 1520 to 1566. During this time the empire expanded and included much of Eastern Europe including Greece and Hungary. The Ottoman Empire began to decline in the late 1600s. It ceased to expand and began to face economic competition from India and Europe. Internal corruption and poor leadership led to a steady decline until the empire was abolished and the country of Turkey was declared a republic in 1923. 1299 - Osman I founded the Ottoman Empire. 1389 - The Ottomans conquer most of Serbia. 1453 - Mehmed II captures Constantinople putting an end to the Byzantine Empire. 1517 - Ottomans conquer Egypt bringing Egypt into the empire. 1520 - Suleiman the Magnificent becomes ruler of the Ottoman Empire. 1529 - The Siege of Vienna. 1533 - The Ottomans conquer Iraq. 1551 - The Ottomans conquer Libya. 1569 - Much of Istanbul burns in a great fire. 1683 - The Ottomans are defeated at the Battle of Vienna. This signals the beginning of the decline of the empire. 1699 - The Ottomans give up control of Hungary to Austria. 1718 - Beginning of the Tulip period. 1821 - The Greek War of Independence begins. 1914 - The Ottomans join the side of the Central Powers in World War I. 1923 - The Ottoman Empire is dissolved and the Republic of Turkey becomes a country. Religion played an important role in the Ottoman Empire. The Ottomans themselves were Muslims, however they did not force the peoples they conquered to convert. They allowed for Christians and Jews to worship without persecution. This kept the people they conquered from rebelling and allowed them to rule for so many years. The leader of the Ottoman Empire was called the Sultan. The title of Sultan was inherited by the eldest son. When a new Sultan took power he would put all of his brothers into prison. Once he had a son of his own to inherit the throne, he would have his brothers executed. The Sultan and his many wives lived in the Topkapi Palace in Istanbul. The Sultan would move to a different room in the palace every night because he was scared of being assassinated. Suleiman the Magnificent was considered the earthly leader of all Muslims. He was called "The Lawgiver" by the Ottomans. The Republic of Turkey was founded by revolutionary Kemal Ataturk. The elite battle troops of the Sultan were called Janissaries. These soldiers were selected from Christian families at a young age. They were considered slaves, but were treated well and paid a regular salary. The Tulip period was a time of peace when the arts flourished in the Ottoman Empire. Tulips were considered a symbol of perfection and beauty.